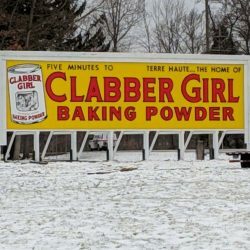 VIGO COUNTY, Ind – The recently restored Clabber Girl sign on US 40 east of town was taken down Tuesday afternoon after several panels fell off. High winds reportedly blew some of the panels down early Tuesday afternoon and the rest were taken down as a precaution. Officials say that there have be high winds before with no problems, so they are trying to determine what happened.